The North Carolina General Assembly has approved the creation of an Arts Education Commission to oversee the implementation of recommendations from the Senate Bill 66 Task Force. The recommendations call for a comprehensive arts education plan where arts are a core academic subject; arts are a catalyst for learning across the curriculum; and where exposure to arts is critical to N.C.’s 21st century education. 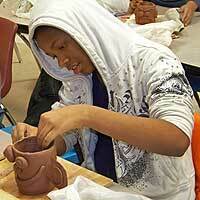 This entry was posted in Uncategorized and tagged 21st century skills, arts are core subject, NC Arts Education Policy. Bookmark the permalink.